Last week I posed the question: How do you capture your thoughts and ideas from your best thinking? A number of you said taking pen to paper allows your thoughts to flow. For me personally, writing brings clarity and sometimes surprising insights, including when I revisit previous writing. One leader assigns the names of thought partners allowing her to move into action faster. She mentally practices conversations based on these notes before meeting with her people. Some of you use your phone to voice record quick captures while running or exercising or as thoughts pop up when you are focused on other priorities. One leader uses the Notes app on his phone for a written record. Some bounce ideas with others they trust, allowing the thoughts to morph and grow. A few said the priorities of the day drive their agenda, admitting they are inconsistent with thinking time. They realize this is not ideal and vow to work on it because they know it is vital to their success. One acknowledged she journals early in the morning but doesn’t capture ideas that arrive later in the day. She committed to carry a small notepad in her purse where she can quickly jot thoughts. Not all of your ideas need immediate action. Some need to marinate, maybe for a couple of hours, overnight, or years waiting for the right time to emerge. Capturing your thoughts, in whatever way works best for you, creates a personal idea bank upon which you can draw anytime. It clears and focuses your mind. There’s even a sense of comfort knowing you’ve catalogued your thoughts and ideas in a place you can easily access. Being able to recall and act on something you’ve thought about and want to do (maybe yearn to do) is the key to your future. 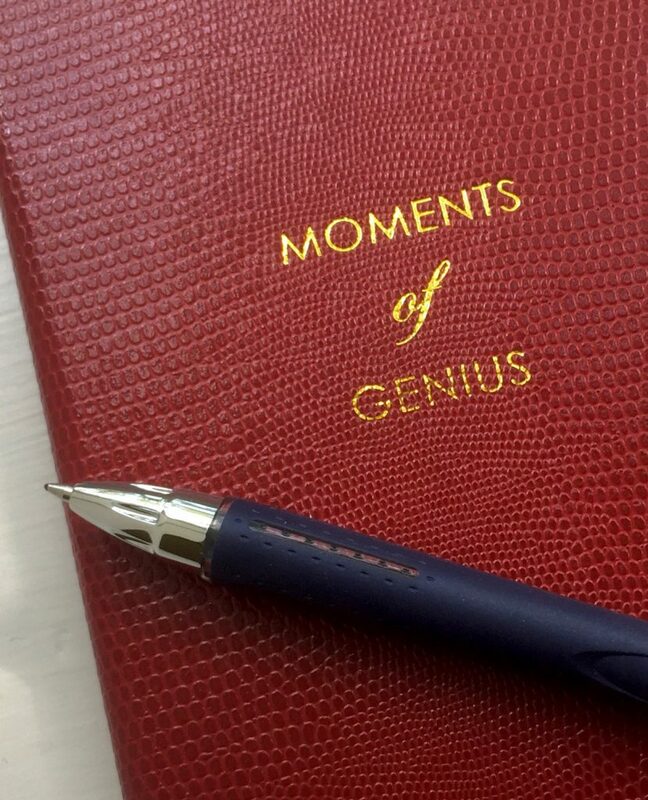 My challenge to you is this… Capture your moments of genius, without judgment. I repeat, without judgment. You may not view them as genius now, but allowed to germinate, you never know which will become seedlings for bigger, better ideas down the road.